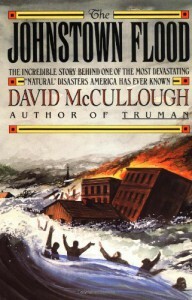 Another great read from historian David McCullough. I like his shorter works, as he is very detailed in his writings. There were a lot of people to keep track of and a lot of geographical area to cover (luckily there was a map in the front of the book). The pictures of the aftermath are amazing and disturbing at the same time. The writing is very action-oriented when the event starts, but there is a lot of back story (pre-Civil War history) that went into the understanding of the event. It was very readable, so I could recommend this to both history buffs and non-history readers.